Harett-Gilmar Puss'N Boots canister puzzle. All 50 pieces are accounted for, although a few of them show a bit of bending, which does not keep them from being usable. The can is not damaged, but does show normal aging. Complete condition photos of can and contents will be available by email. I need your zip code to calculate the postage. I really don't know much about this novelty ashtray. I bought it, years ago, because it looks like Houze glass. 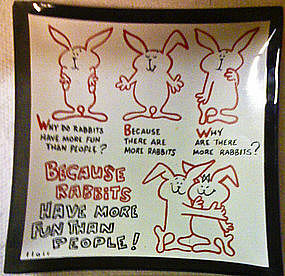 It is marked as "flair" and has cartoon like graphics of "Why Rabbits are Happier than People." It measures approximately 5 x 5 inches. There is a small chip on one corner and a rough spot on another. I need your zip code to calculate the postage. This platter is marked as H 144 2. 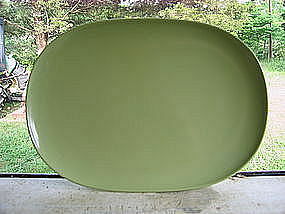 I am not sure of the manufacturer, although the color is much like Texas Ware. It measures 11 3/4 x 8 1/2 inches. There are light utensil marks. I need your zip code to calculate the postage. Unopened bottle of Aqua Velva in carnival glass celebrating the Bicentennial. Unfortunately, I discarded the display box with the copy of the Constitution, many years ago. There is a bit of the sticky material on the back of the bottle that held it in the display box and a little wear to the finish of the lid. I need your zip code to calculate the postage. 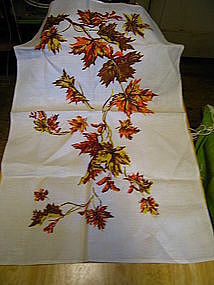 Vintage autumn leaves tea towel in what appears to be a linen fabric. It measures approximately 27 x 16 inches. There are no rips, tears or stains. I need your zip code to calculate the postage. 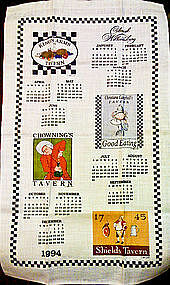 Colonial Williamsburg 1994 calendar. It looks like linen, but could possibly be a synthetic fabric. Originally, it had a dowel and ribbon for hanging, but I think I threw them away, for easy storage. 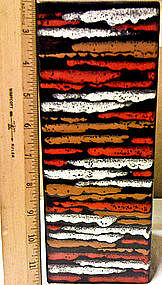 It measures 27 5/8 inches in height and 16 inches in width. There are no rips, tears or stains. I need your zip code to calculate the postage. This Italian vase has the original Rosenthal Netter labels. It is 10 inches in height. It is square with 3 sides glazed in black and remaining side is black with red, white and brown design. There is no damage to this piece. I have a matching covered box and smaller vase available for sale and priced individually. I hope to have photos available in the near future. I need your zip code to calculate the postage. Vintage kitchen knife marked as Robinson Stainless USA. 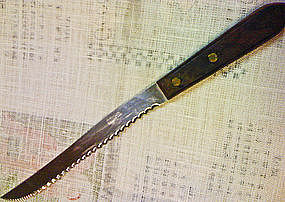 It has a wooden handle and serrated blade. 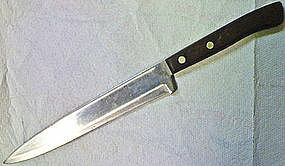 The blade is 7 1/2 inches and the handle is 4 5/8 inches. 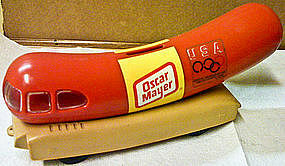 The blade shows usage and cleaning marks and the handle shows use wear, but no splits or cracks. I need your zip code to calculate the postage. Vintage Fuller basting brush measuring 7 1/2 inches. It is unused, but show superficial wear from being in kitchen drawer. I need your zip code to calculate the postage. 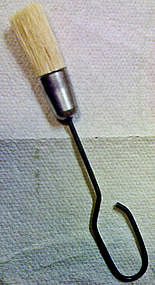 Vintage wooden and stainless steel corn stripper by CMI (Chadwick). It was manufactured in Japan. It comes with the original box and has the instructions printed on the back. There does not appear to be any damage to the stripper but the box shows age wear. Complete photos by email. I need your zip code to calculate the postage. 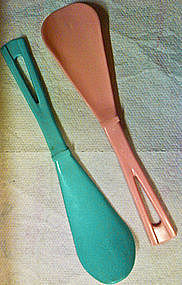 Set of two (2) pink and turquoise blue (his and hers) plastic shoehorns. They measure 8 1/4 inches in length. There is no structural damage but show light drawer/storage wear. I need your zip code to calculate the postage. 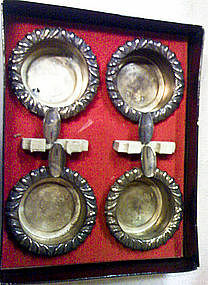 Set of four (4) silverplated individual ashtrays marked Made in Italy. They measure approximately 2 inches in width (does not include the cigarette rest) and 3/4 inches in height. There are no dents or dings, but have been neglected and show some loss to the silverplate. Complete I need your zip code to calculate the postage. Set of two (2) porcelain mice, marked Japan. They measure 3 3/4" height and 3 3/4" width (measured at ears). They have have been displayed for many years and need cleaning, but there is no damage. I need your zip code to calculate the postage. 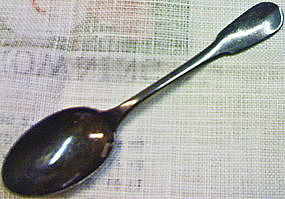 The spoon is marked Air France and Christofle on the interior of the bowl and the backside of handle is marked with AF. It feels and looks like sterling, but does not appear to be marked. It is slightly over 5 inches in length. It has some usage marks. I will provide complete detailed photos of condition. I need your zip code to calculate the postage. Sterling cream soup measuring slightly over 6 inches in length. It has not been polished in many years and has light usage marks. I need your zip code to calculate the postage. 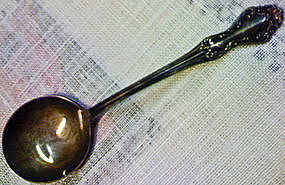 Demitasse spoon marked Fairfield Silverplate. 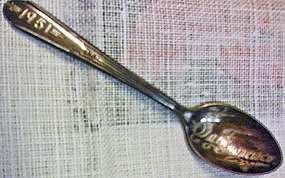 The bowl of the spoon is ornately etched San Fransisco and the handle is etched 1951. There is no damage. I need your zip code to calculate the postage.